The focus of the last two posts was on the “blue pill” as it regards our “progressive” education system. I have written several previous posts dealing with political prescriptions for “blue pill” thinking. The imagery and tone of those pieces and this one may lead you to assumes I am associating all things “blue pill” with liberal/Democrat/ “blue state” politics, and red pill rigor with Republican/conservative/”red state” politics. You would only be partially right. Our education and media elite are certainly dominated by those who would prefer a tame, conditioned electorate, but that desire is not exclusive to the panoply of progressive poohbahs. There is no shortage of conservatives/traditionalists that would like to impose their own brand of “blue pill” virtuality upon us using the existing, Prussian-model school system. The pill would be “branded” quite differently, of course: Teaching of creationism/intelligent design as science and mandatory recitation of the pledge of allegiance (a loyalty oath) by children too young to understand the concept of total commitment are two ways that come readily to mind. So what can be done? Ultimately, a “red pill” solution would entail the separation of school and state, in the same way and for the same reasons we have separation of church and state. Whoa! How can you say such a thing, Cronin?! If we don’t have public education, we’ll have a bunch of uneducated kids running around that can’t think critically, getting into mischief and gangs and criminal conduct! We won’t be competitive in the global market! How would that be different than what we have now? I ask you: If a thing can be done privately, what business does the government have doing it? Unlikely. The key ingredients missing from education in a system monopolized by government are competition and choice. In a competitive education market, schools would have to meet their customers’ expectations or go out of business. Good teachers would be highly sought after and well compensated. Bad teachers could be fired. Government is force. Government performs exceedingly well where force is the required tool to solve a problem. At best, government achieves a desultory mediocrity at everything else it does. Is force the correct tool to use to educate our children? 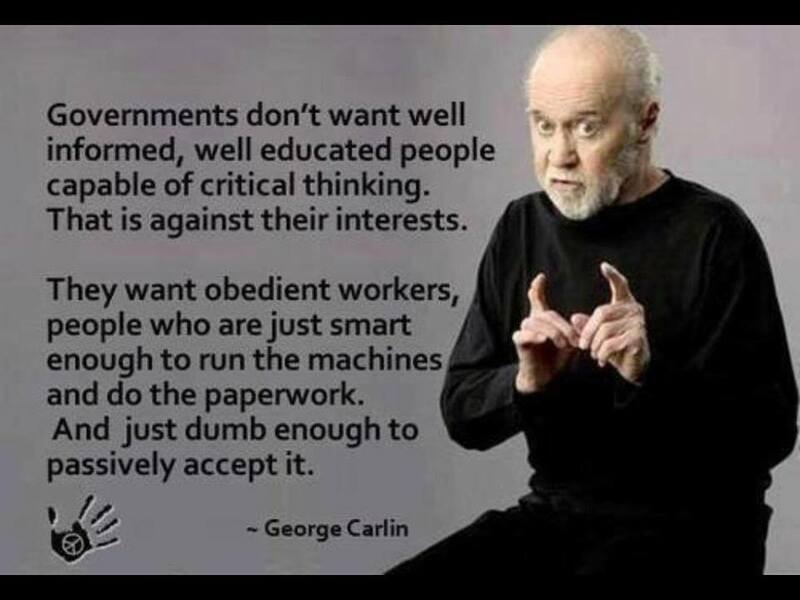 We are indoctrinated by a school system designed to mass-produce workers and consumers, “informed” by a mass media machine that continuously keeps us alarmed, and led by politicians whose only concern is getting elected or re-elected. How could anything be wrong?